The reaction was successful for a range of aliphatic (e.g., methanol and ethanol) and benzylic primary alcohols and tolerated the presence of aryl flouro and ether groups as well as silyl groups. 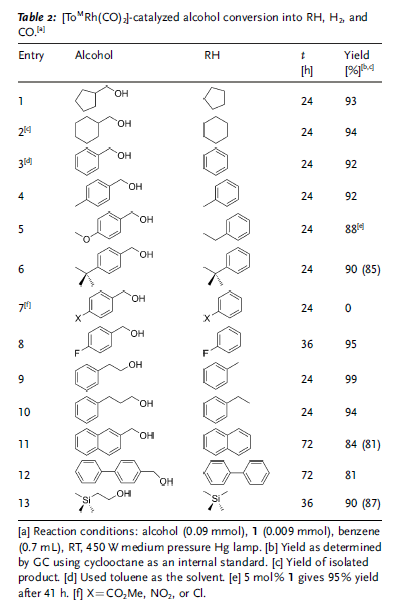 The authors note that benzylic alcohols are a central component of lignin. The reaction did not tolerate aryl nitro, chloro or ester groups. The authors then explored the mechanistic details of the reaction, noting that small amounts of the aldehyde were detected during the reaction and that using the aldehydes directly provided the hydrocarbon under the catalytic conditions using either 1 or 2. Furthermore, the presence of CO did not inhibit the reaction at 1 atm, but did inhibit the reaction at 5 atm. No aldehyde or hydrocarbon was detected in the absence of light. The observation that catalysis with 1 and 2 proceeds at different rates suggests distinct intermediates, although no catalytic intermediates were detected in the authors’ present study. The catalytically active intermediate from 1 is likely ToMRh(CO) (3), provided by photolytic dissociation of CO. In contrast, photolytic CO dissociation from 2 would afford the dihydride ToMRhH2 (4). The hypothesis that CO dissociation is required for catalysis is supported by two observations: (i) the lack of thermal reactivity of 1 with alcohols and (ii) the reaction of ToMRh(H)2(NCCH3) with cyclohexanemethanol, which provides cyclohexane as well as 2 (likely via acetonitrile loss to give the proposed dihydride 4). With this information, the authors propose the following, simultaneously-operative catalytic cycles. It is interesting to me that catalysis from 1 requires two photons per cycle, while just a single photon is required for 2. I’m not sure how you could experimentally confirm this, though. In summary, the Sadow group describes a new application for their rhodium tris(oxazolinyl)borate complex as a photocatalyst for the decarbonylation of alcohols. Although I didn’t cover it, they also apply this catalyst to the photocatalytic conversion of amines to imines, a reaction which follows a different route than alcohol decarbonylation – namely, dehydrogenation of the primary amine to form an aldimine followed by reaction with a second equivalent of amine to form the observed imine product with the presumed loss of ammonia. It is thus noteworthy that their catalyst can handle both oxygen and nitrogen functionality. Going forward, I hope to see this work extended to diols and polyols. By tmckeagberkeleyedu in Synthesis on October 23, 2012 . This is awesome – one big drawback of most deoxygenation reactions is the necessity of a stoichiometric reductant. I like how this reaction gets around that problem by losing the oxidized fragment as CO. Excellent point. In some of my grad work I used Ru in a reaction that produced CO and H2O as byproducts, which underwent the water-gas-shift reaction to produce CO2 and H2, which reduced the molecule of interest. I wonder what would happen if they 1) used substrates capable of being reduced further and 2) added some water. I’m almost positive Rh can catalyze the water-gas-shift reaction. Your grad work reaction sounds like an awesome reaction Lee! Do you have a link to it? Somewhat related to your comment, H2 is already present in their reactions and they note that their Rh compound doesn’t catalyze the hydrogenation of the imine obtained from the amine coupling chemistry. But with different substrates and/or catalysts, they might be able to improve their atom economy by incorporating the released H2 in the product. Or better yet, if their catalyst could do Fischer Tropsch chemistry, then they could use the released H2 and CO to make more liquid hydrocarbons, though there would be a separation issue with the hydrocarbon from the alcohol decarbonylation. It might take high temp and pressure though. Also, awesome stuff. Bummer it has to use rhodium! So expensive! wow, we don’t need to heat carboxylic acid under reflux for a long time!